WOW! 500 followers on Bloglovin - I cannot believe it! As the numbers have been slowly creeping up recently I knew I wanted to do something when and if I hit this milestone as I am totally overwhelmed by the love and support I have been getting from everyone both on here and on twitter! So there are FIVE prizes and there will be just ONE winner! One of my favourite perfumes ever - you all know I love Taylor Swift so the fact it smells incredible and is by her just makes me love it even more! The amount of times I've mentioned this on here and twitter is countless! This stuff has saved my hair and helped it grow from a short bob to hair that is slowly going past my collar bones in just a matter of months - it makes your hair stronger and so soft, not to mention the amazing Lee Stafford scent! A total lifesaver in my opinion, I have been using Tangle Teezer's for years now and could never go back to a normal hair brush! I did a whole post on this not long ago, a gorgeous highlighter with multiple uses - an amazing High Beam dupe too! My go-to pink lipstick, I have been using this for so long I cannot imagine life without it! An amazing bright fuschia shade - a must-have for ever girl! Mentioned in my 'Pink & Pouty - Lipstick Favourites'. Leave a comment below leaving your blog/twitter. The more you do the more chances you have of winning - simple! This giveaway will run until 12am November 30th 2013. Good Luck you gorgeous lot and Thank You Thank You Thank You!!!!!!!! Congratulations, Kristie!! You deserve it! I follow you on twitter and I'm always seeing you hustle. Got my eye on that hair growth treatment and that tangle teezer! WOW these are lovely prizes, congratulations on the 500 followers. Congratulations :) such a lovely prizes! Such an amazing giveaway! I haven't tried any of these products but would love to! Congrats for gettin to 500 followers! Congrats & do keep blogging! Congrats on your 500 followers milestone! I am a bit of a perfume addict and have so many great things about Taylor Swift's Wonderstruck, but I've never tried it! It is something I've been meaning to try out for a while so that, combined with your other great prizes, makes me really hopeful that I win! Fingers crossed! Such a generous give away, I'd love to try that Taylor Swift perfume! Congrats on your milestone and keep up the good work with your gorge blog, it's always been one of my faves! 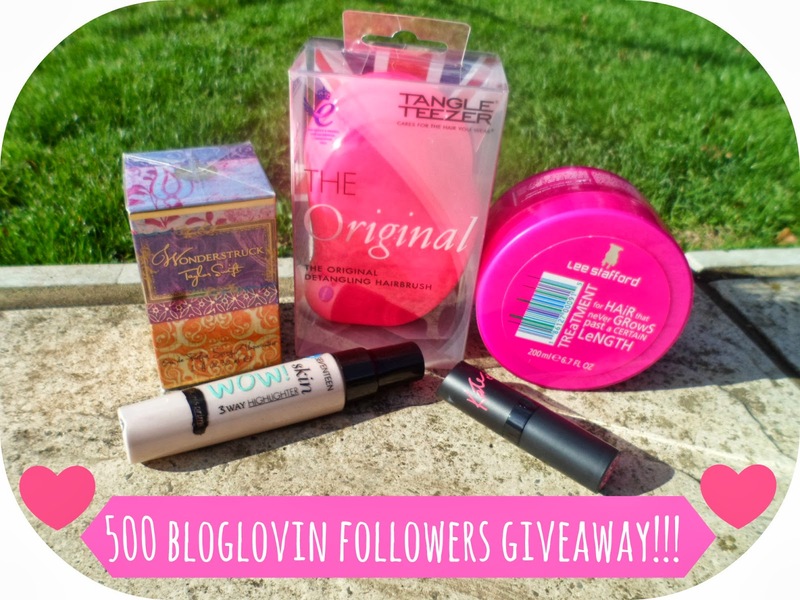 What a fab giveaway, Kirstie! Congratulations on reaching such a milestone! I've been so close to ordering the Taylor Swift perfume for a few months now - it's so nice! massive well done babe your amazing! Well done! Thats such an amazing milestone! Congrats on the milestone! Such a lovely give away too! Many congrats on your 500 followers! Nice achievment! And thank you for the giveaway! Congrats on your BIG 500 followers milestone.. Such a great achievement. Your blog is doing so well. Congratulations!! And thank you so much for this! Congrats on 500 followers, you are suuuch an inspiration to my own little blog and I think you totally deserve all this success and much more to come! Ive actually only just started my blog today aha! I just discover your blog, it's amazing, my congratulations. I start follow you on Fb, Bloglovin and GFC. Unfortunately I don't have Twitter but I hope can take part to the giveaway the same. Big congrats on 500!! I remember retweeting you when you were nearly at 150! Look how far you've come since then! Great giveaway too! I've never tired the Tangle Teezer and I've been dying to try the Lee Stafford Treatment. So many of these are already on my christmas list!!! Great giveaway! Congratulations on the 500 followers :) I like your blog very much! Lovely blog! I just started following you. Hope to see more helpful reviews from you soon. Congratulations, looks like a lovely selection for a giveaway! I've entered! Would love to win! Congratulations on 500 followers! Amazing giveaway. This is very nice giveaway! I'm intrigued by hair grow product :) I will have to google it to find out more! I hope your followers will only grow on all social media platforms! Congrats for yours 500 followers! Congratulations on your milestone! Such a massive achievement :) Would be so excited to win these lovely prizes, fingers crossed!